This article was previously covered on Astrobites, but here is another Astrobiter’s take on it! Today, what exactly caused reionization remains a puzzle that many scientists are eager to solve. Sources such as supernovae, active galactic nuclei, binary mergers, and more recently, faint dwarf galaxies have all been posited as significant contributors of ionizing photons. Regrettably, constraining them with observations, especially in the case of faint sources, is far from easy and continues to render the pursuit inconclusive. In the wake of this situation, author Boylan-Kolchin turns his eye towards something that has long been a corner-stone of the study of early galaxies. These objects are tightly bound collection of stars a.k.a globular clusters (GCs), whose numerousness and ancient origin (coinciding with the EoR) make them important objects in the context of cosmic reionization. In his work, the author seeks to theoretically infer the contribution of GCs to reionization, and spell out its implications. 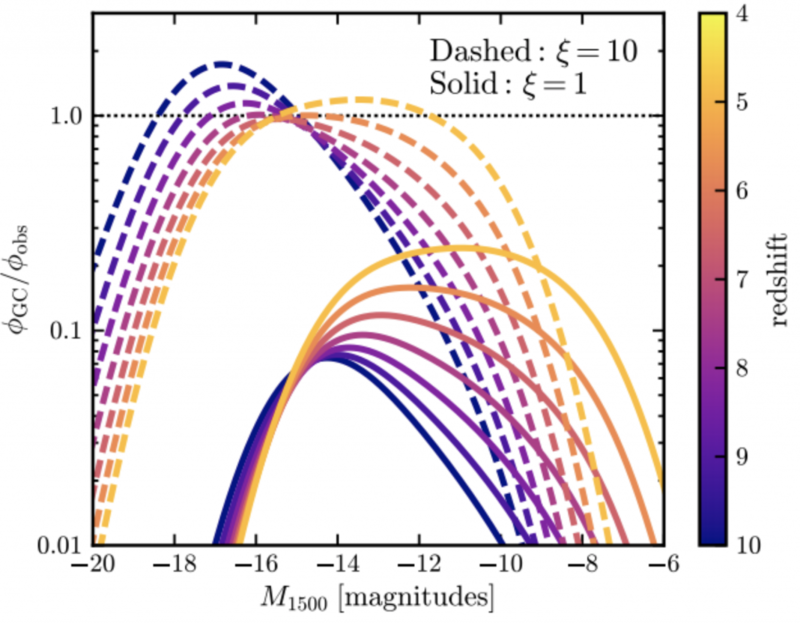 Using the number density and stellar mass distribution of GCs from local observations, and a uniform rate of formation over 1 Gyr (redshift z ~ 4-10), he artificially synthesizes stellar populations characteristic of a GC to obtain its ultraviolet luminosity function (UVLF; the number distribution per unit volume and magnitude in ultraviolet wavelengths) at various epochs. Upon modeling the GC UVLFs, the author observed that even though GCs assume a bell-shaped distribution at the start of their formation period, the passive fading of early-forming GCs coupled with the continual formation of new ones lends the overall intrinsic (uncorrected for blockage by dust or gas) UVLF a power-law shape with a cutoff at low luminosities (higher magnitudes; see Figure 1). 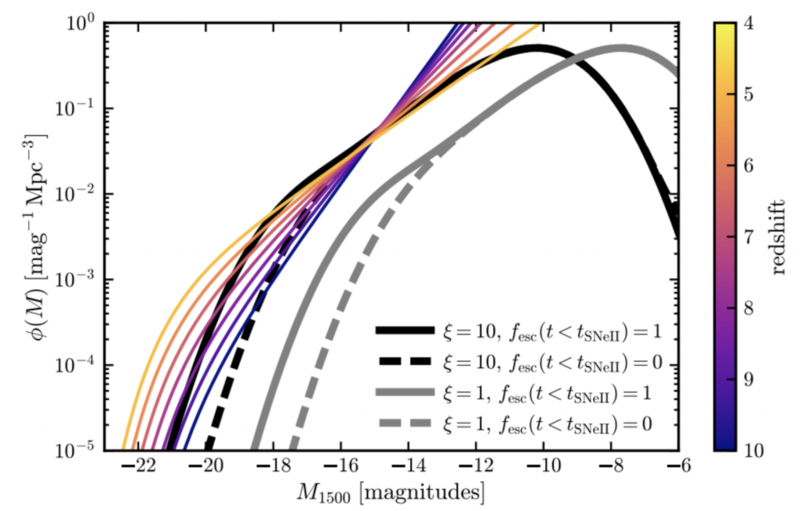 This means that at any given epoch, the bright portion of the UVLF would be predominantly shaped by the youngest GCs, while older GCs contribute to the bulk of the curve at low luminosities. Figure 1. Left: Modeled GC (at the end of the formation period) can be approximated by a power law (Schechter approximation). Right: The contribution of GCs with various ages (colored lines) to the GC UVLF at the end of the formation period (black line). When modeling what the observed GC UVLFs should look like, much depends on the assumed fraction of total light that is allowed to escape unobstructed from the environment of the GC (fesc). Usually, since GCs predominantly reside in the far outskirts of their host galaxy, photons can easily escape through the rare medium surrounding them. However, whether a GC can still internally obstruct any light depends on how much gas it holds, and hence, its age relative to the timescale of gas evacuation by type II supernovae (~10 Myrs). To this end, the author reports that changing the value of fesc majorly affects only the bright end of the UVLF, as shown in Figure 2. Figure 2. Observed UVLFs at different redshifts (colored lines) against modeled GC UVLFs (black/gray lines) for different ξ (see next paragraph), and scenarios where either all or no light escapes from the GC at early times. Finally, when confronting the models with real observations, the contribution of GCs to the overall observed UVLF seemed to depend substantially on the birth mass of stars comprising the GC relative to their current masses, ξ. As seen in Figure 3, at minimum (when ξ is low), the contribution of GCs to the global UVLF is sizeable, but can also potentially dominate in case of large ξ. Figure 3. Ratio of GC UVLFs to global UVLFs at different redshifts for ξ = 1 (solid lines) or 10 (dashed lines). Even though the analysis done in this work has substantial avenues for improvement, such as working with detailed observational estimates of ξ, employing constraints on the length of GC formation period, and studying the dependence of results on the choice of the initial mass function, the insights offered by the simple models described by the author are of great value to constraining the properties of GCs in the high-redshift universe. Moving forward, observations from space missions such as the Hubble Space Telescope, as well as James Webb Space Telescope, would be able to further corroborate the findings of this work by detecting individual GCs, especially in galaxy halos as massive as our Milky Way or more. Astronomy grad student doing computational research in galaxy formation and evolution in New York City. In my leisure time, I like to go Latin dancing, enjoy live theatre/music, and take on cultural and culinary pursuits.